If you like to cook and like to entertain, a self-catering business may be the ideal career for you. Starting a self-catering business requires small start-up costs and can be a step toward one day opening your own restaurant. The good news about starting a self-catering company is that you can start small – in other words, you can keep your day job. As your catering business grows, you may consider taking on catering as your full-time profession. Weigh your options: can you afford to lose a steady paycheck? How do you handle stress? (Be honest). Consider your family situation. Running a catering business involves long hours, especially on nights, weekends and holidays. How will that affect your spouse and/or children? Being your own boss is a highly personal choice that shouldn’t be made in haste. The next step toward starting a self-catering business is to know your competition. Just like if you were getting ready to open a new restaurant, you need to know the menu and prices of other caterers in your area. This will help you plan your own menu and keep you from pricing yourself out of business before you even get started. 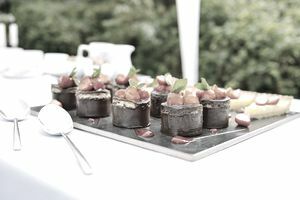 A catering menu can be as simple as finger rolls and potato chips or as elaborate as caviar and truffles. Much like a restaurant menu, a catering menu should offer a mix of old favorites (cheese and crackers never go out of style) and signature dishes that set you apart from your competition. If you are going into the catering business, it’s probably because you are a good cook (right?). So, now is the time to let our favorite dishes shine. Like selecting a restaurant name, choosing a name for your catering company can reflect your food, location or be a play on words, such as On the Go Catering. If you choose to name your self-catering business to reflect a certain type of cuisine, such as Marie’s Fine Italian Catering be careful it doesn’t limit your clientele. What if Marie offers non-Italian food, along with her fine pasta and sauce? People wouldn’t automatically assume that she also makes finger rolls and chicken pot pie. Most states require any food business to obtain a myriad licenses, insurance and permits, including, but not limited to: liquor licenses, unemployment insurance, worker’s comp insurance, food handlers permit, etc…And, you will also need to incorporate your business so you can pay taxes. If you are just starting out, you may be able to use your social security number. If you incorporate, your business will be assigned and EIN number. As your self-catering business grows, you will need extra staff. Most likely, at least in the early business years, staff will only be part time. Look for personable, organized individuals whom you can comfortably delegate tasks. Your initial start-up costs for self-catering equipment will depend on your budget. You may be able to get by with a few nice serving platters and use whatever cooking equipment you have in your home kitchen. But if you are looking to expand you catering business, you will eventually need to upgrade to commercial equipment. If you can afford it right at the beginning, invest in a website, since more and more people turn to the internet to find goods and services. At a minimum, your website should have contact information, menu packages and prices and some good photos of your food or past events. Beyond a website, you may consider joining your local chamber of commerce or other small business organization. You can create an attractive self-catering menu right on your home computer and have it professionally printed for a reasonable cost.